Teen Amateur Of The Week - George Fotopoulos! George loves being in control of his body and seeing it respond to what he wants it to respond to. He loves the healthy muscular image, looking so pure and attractive to the average person's eye. with my two buddies Kyle Laya and Patrick Shanley. Then I started talking to my older cousin from Schumburg, Ilinois. He has been bodybuilding for years, and we thought it was time for me to start sculpting. I had no clue what bodybuilding meant. Monday, Wednesday, Friday abs and calves 20 minutes of cardio after training. I love being in control of my body and seeing it respond to what I want it to respond to. And also I love the freaky look. I love the healthy muscular image, looking so pure and attractive to the average person's eye. 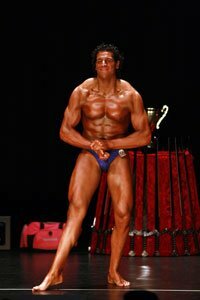 To be on a pro natural stage with the big boys by the age of 21 and to be the freakiest junior ever. Go in get your work done and never leave the gym thinking you didn't leave everything on the floor. The forums and the store.